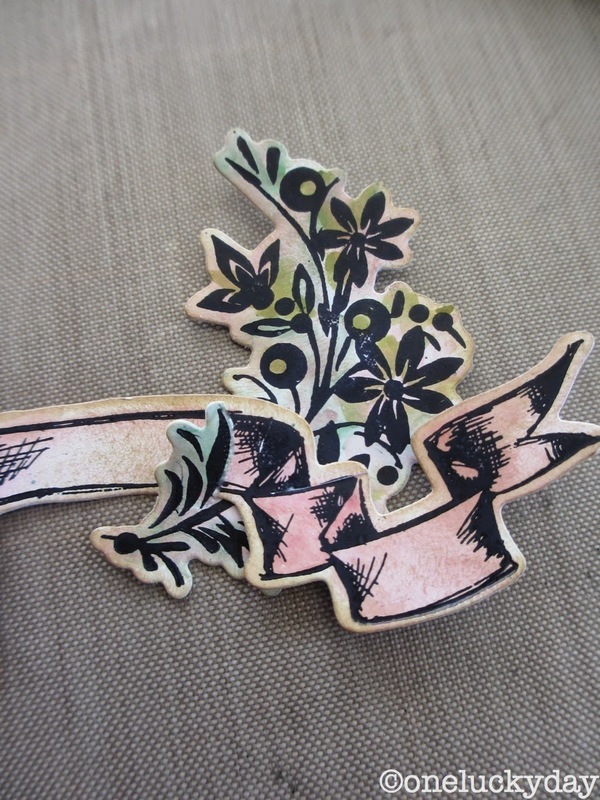 When Tim posted his tag last month he used a Sizzix Framelits die. The tag was wonderful (of course) so I decided to try my hand at creating a card using the Framelits - Framed Silhouettes. Each Framelits set comes with a set of stamps and the matching dies. I have always liked this frame so I thought it was a good one to use for the card. I stamped all the images I wanted to use with Archival Ink onto Specialty Stamping Paper...because I'm just a little obsessed with this paper right now (the image is so very crisp). Then I colored the images with Distress Markers and my water brush. Yeah, for coloring outside the lines! You sure don't have to be precise with this technique (maybe that's why I like it). I used the Sizzix Magnetic Platform and the Framelit dies that match the stamped images. Just make sure you follow the instructions to get the right "sandwich". 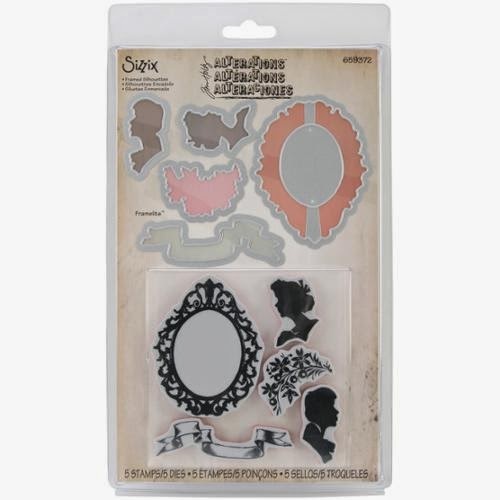 Which is... Sizzix Magnetic Platform on the bottom, a cutting pad, then your stamped paper, then the Framelits dies, then another cutting pad. If you would like to see my friend Stephanie Barnard from Sizzix demo this platform and show the "sandwich", just watch her 2 minute video here. The magnets in the platform are so strong you can stand the platform up and they do not even move! They look so nice all cut out! I know I just showed monoprinting a few weeks ago in my Simon Says Stamp tutorial, but today were going to do a double monoprint (i'm not even sure if that is a real thing...Well, it is today!). 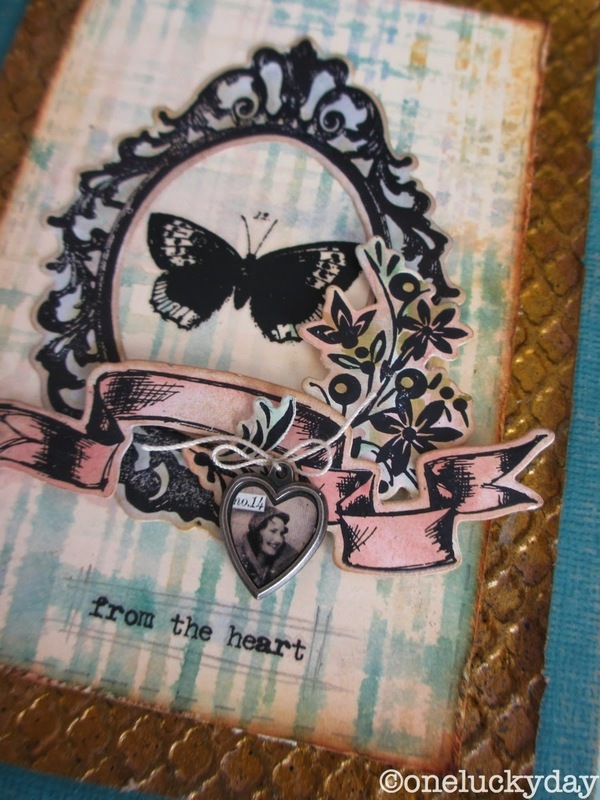 Gather your supplies...Distress Ink, Layering stencil and #8 tag. 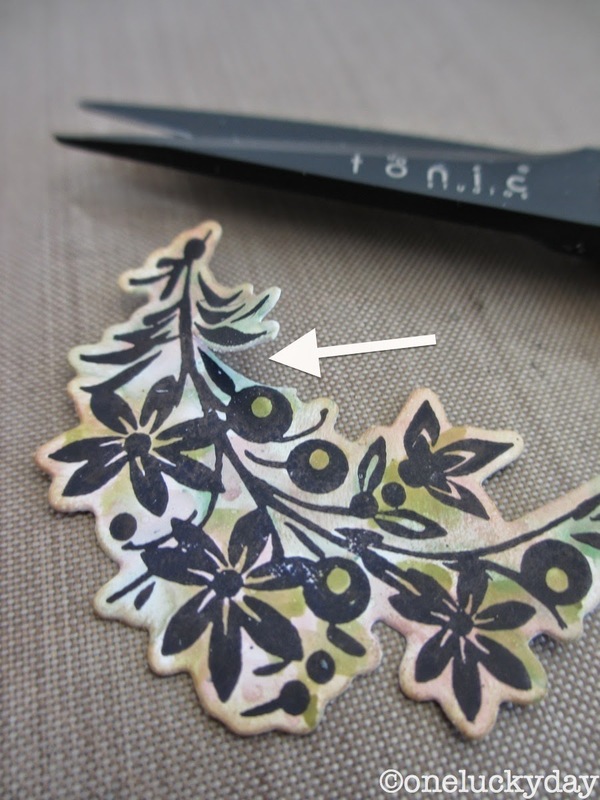 Use the Mini Distress Ink pads to cover the stencil surface. Give it a good spray - don't underestimate the amount of water you need! Flip it over onto the #8 tag. Press down with a paper towel to soak up any excess ink. And there you have the 1st monoprint. You can see on the right side where I needed a bit more water but it's a small patch so I'm cool with that. For the second monoprinting, I repeated the same steps to ink and spritz the Layering Stencil. But this time I wiped off the wide edge of the stencil with a paper towel before flipping it over onto the tag. To create the plaid design you will need to lay the stencil over the tag horizontally. You only have to ink the stencil once, if you use half the stencil for the top, then pick it up and use the other half for the bottom. If you don't like that method you could ink the stencil a third time. And then the top half of the stencil that still had ink on it, to finish the design. 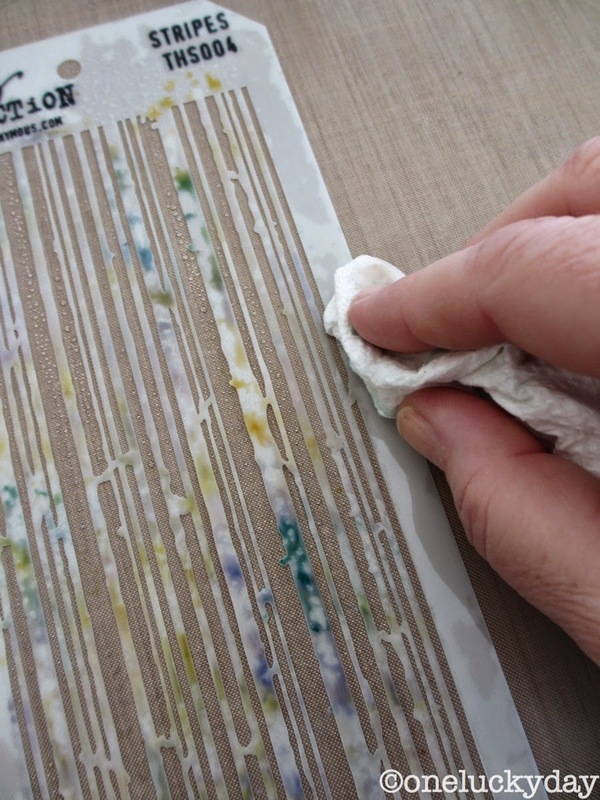 Blot off any excess ink and dry with the heat tool. I think it looks really cool. Love the Mini Distress Pack with the Spun Sugar, Evergreen Bough, Scattered Straw and Shaded Lilac. So, lets gather all the pieces we have made so far and ink them with Vintage Photo Distress Ink using a Mini blending tool. I cut a card base from turquoise Core'dinations Cardstock and also a piece of kraft cardstock. I used the texture folder, Trellis to create the texture on the kraft cardstock. Then I painted the entire piece with Distress Paint in Tarnished brass. I purposely created puddles of the Tarnished Brass paint to create more richness and texture over the kraft paper. I did have a to wait a bit for it to dry, but I think it was worth it in the end. Once dry, I used the Spritzer tool and a Black Soot Distress Marker to create another layer over the gold paint. I cut the tag to fit the card front (I used a little foam tape to raise it up off the gold cardstock). Added my frame and a butterfly from the Remnant Rubs: botanical. So I could do this with the banner. Then the banner and floral spray (again, with little bits of foam tape on the back) was added over the frame. Remnant Rubs -Words and a Heart Charm added and I'm done. Loving the pop of the gold background. That Texture Fade is awesome (love the small scale). And seriously, the Framelits couldn't be easier to use. The plaid background just makes me happy! "I was just getting irritated with my glue gun yesterday as it kept tipping over on my craft table. I was thinking about sticking it in a clay flowerpot (a tip I saw on Pinterest) but didn't have one handy. The Hobby Holster is THE PERFECT solution. I would love to win this!" ldybg93 please send your shipping address to paula@oneluckday.net so I can get your prize in the mail! The cross-hatch monoprint is soft and reminiscent of a good plaid; it has a Scottish heather feel to it. Very vintage. love that plaid work! genus! Have a happy 4th and thanks for the inspiration! Oh my word ... that is so beautiful ... fun plaid tutorial ! Love those colors (okay I need framelits like that ( I just want everything) Okay I gotta work a plan to live closer to people who have the same "addiction" so we can share supplies... obviously I can't have everything :) !! Gorgeous - love that background. mOnoprint and all gorgeous piece as always. Wonderfull Art work you´ve made to Show us !!! Well smack my forehead I never woulda thought to make plaid with that stencil (which I actually have, yay!). I can't wait to try this out with Halloween colors and Christmas colors. Thanks for sharing! LOVE the soft plaid and the trellis texture fade! More to put on my wish list:)) Great card! As with everyone else, I love the plaid! Love the plaid. Love the card. Beautiful work. What a beautiful card! I won the Hobby Holster and am so excited - first time I've won something!! Thanks so much to Paula for the giveaway and thanks to the other commenters for the congrats. Congrats on winning and enjoy your prize ldybg93! Paula, another beautiful creation and great tutorial. Thanks. Paula you are so clever and creative. You inspire me. Thank you so much for sharing your talent with us. I love your ending, "Carry on!" LOVE that background...can't wait to try it. Thanks for sharing and congrats to the winner! Amazing textures - love the plaid background! Thanks for sharing the card I love how it turned out. Congrats to ldybg93! Awesome Win and fabulous tutorial, Paula! Love the plaid technique and am going to give a go tomorrow. Love everything about this pretty card. Thanks sweet lady. Congrats to the winner! Love that plaid monoprint. Gonna have to give it a whirl. Beautiful!! Just love your picture tutorials! Love Love Love this ... thanks for the ideas and inspiration. Beautiful tag here, I love it! Wonderful tut! 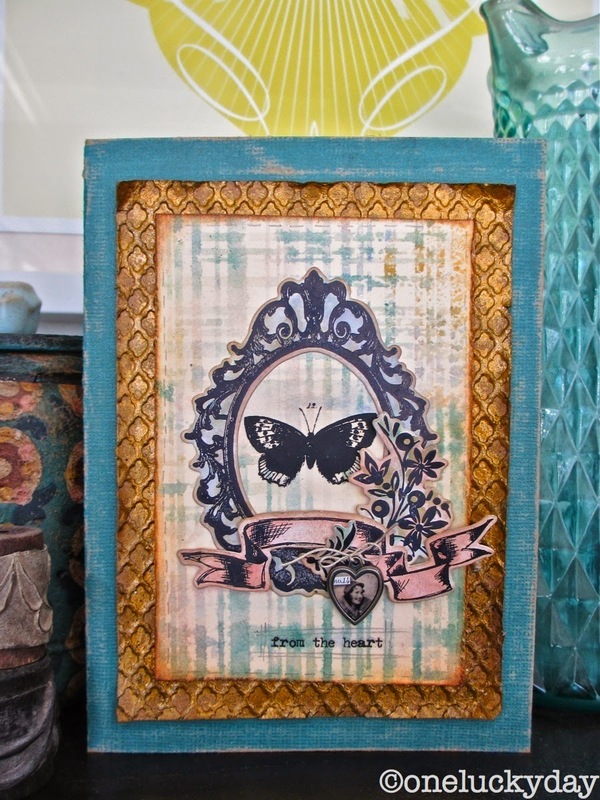 I love love the brass lattice background with the specks...AWESOME!!! Beautiful! I love the double printing to make the plaid background. This technique is fabulous! I love the coloring and the color palette too. o my goodness- this is so beautiful! Really nothing else need be said!